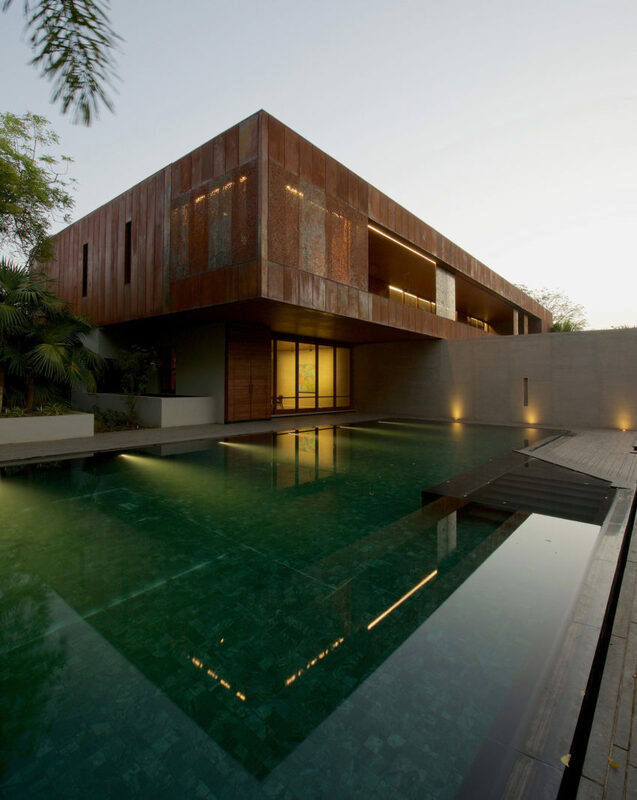 DIYA is a private home located in Ahmedabad, Gujarat, India. 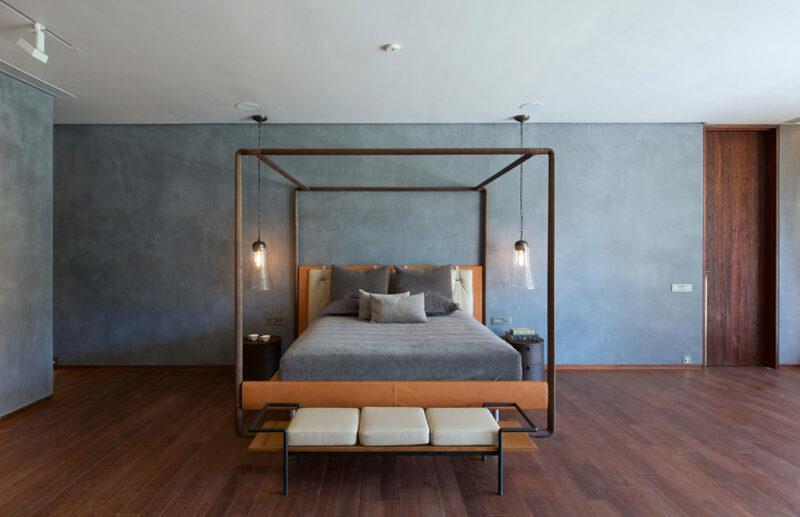 It was designed by SPASM Design Architects in 2016. “Ahmedabad, is predominantly dry through the year, though it does rain occasionally during monsoon months, from late June to August. The clients a young couple with a daughter of 9 and their parents, contacted us for a family home. 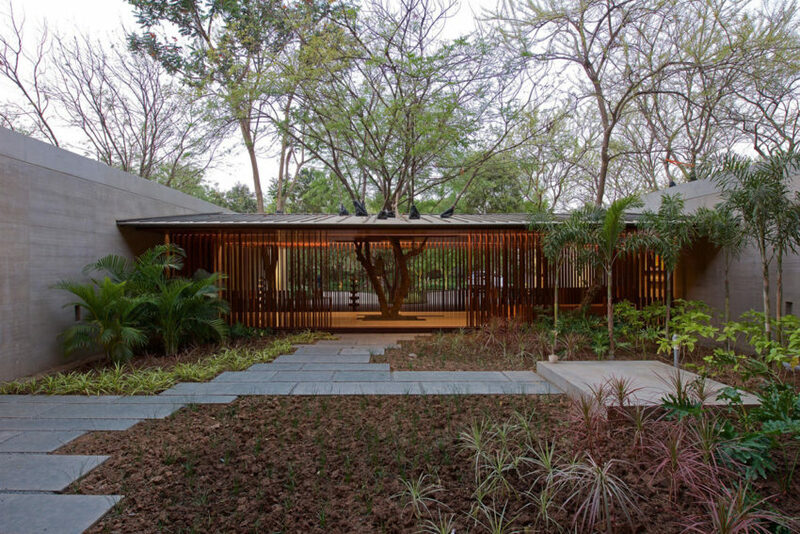 Pre-existing trees, and a large lawn, prompted the exact positioning of the built form, the lower level, weaves spaces around trees, retaining all 284 of them. 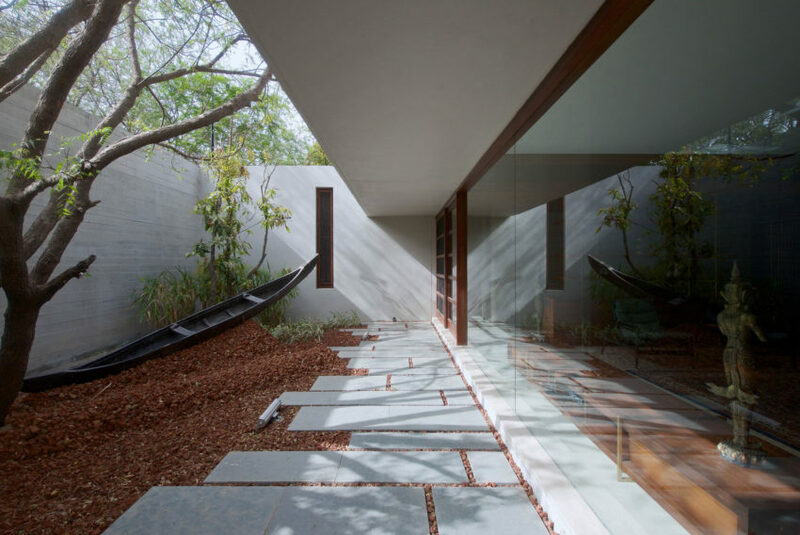 Several foundations were carefully positioned and HAND DUG to preserve roots, and the trees became generators of specific vistas and open to sky courtyards resulting in a FORMLESS LABYRINTH OF INTERCONNECTED SPACES. 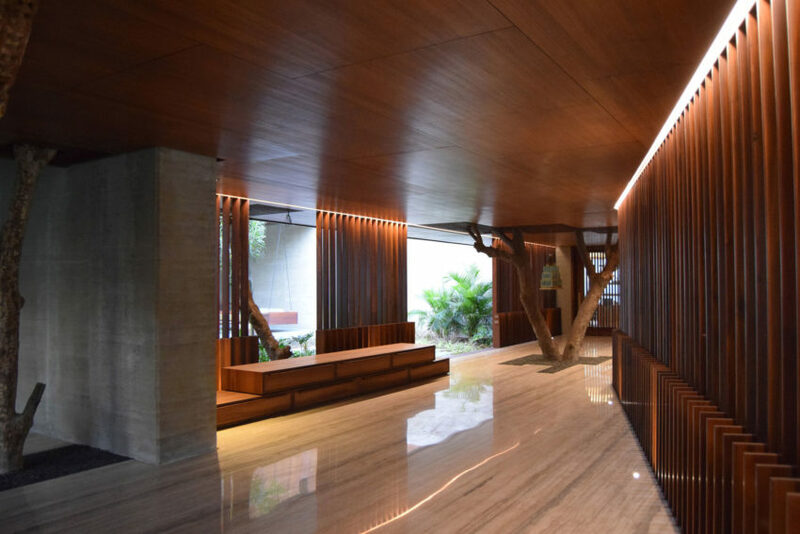 ARRIVAL, is announced by a 16 meters (52.5 feet) column free span canopy, which creates a 2.4 meters (7.9 feet) high entry space, bound by vertical pivoting wooden louvers. 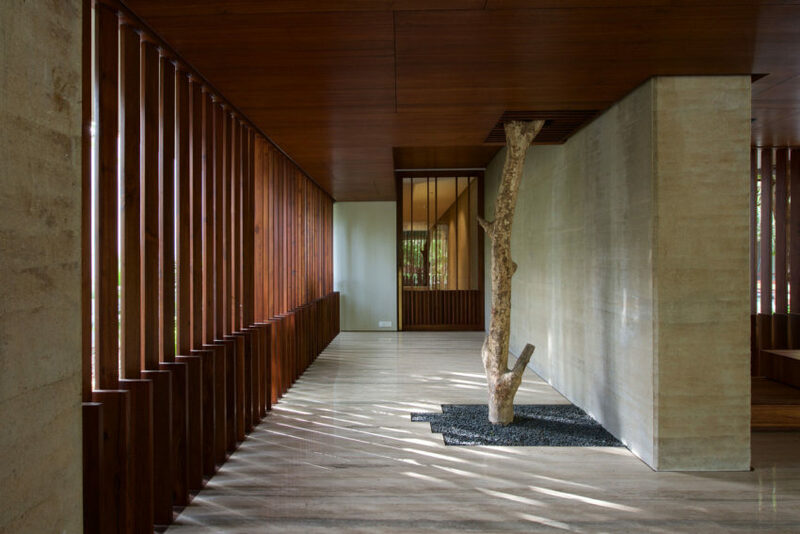 This FILTER like space, allows breezes to freely flow through to the main courtyard beyond, and frames an existing NEEM tree as a sculpture, a powerful presence of nature is sensed throughout the house. 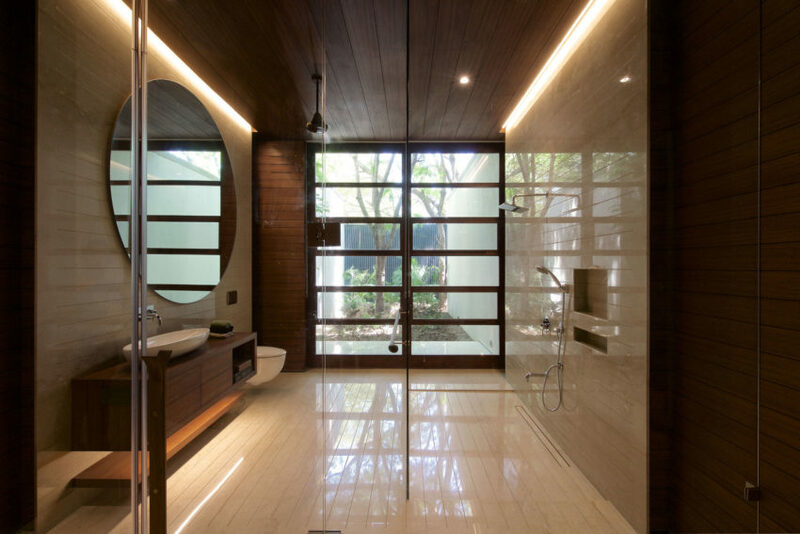 The architecture deploys DIFFERENT STRATEGIES, to mitigate the intense heat. 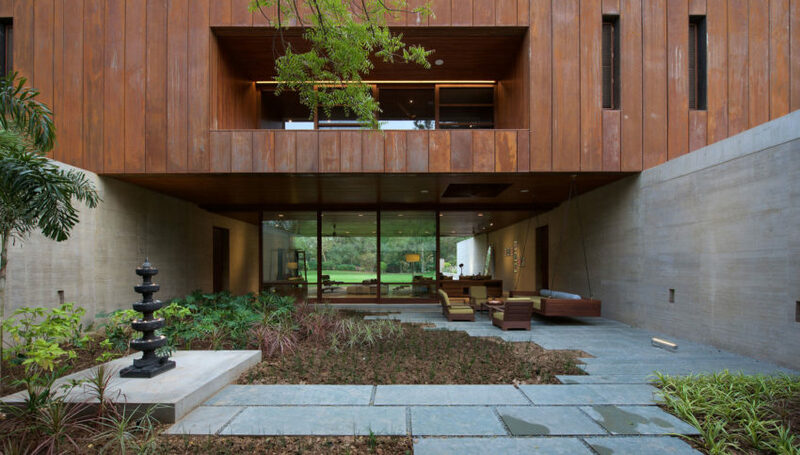 An ORGANIC PLAN, bound by Massive rammed earth walls with high thermal mass, and COURTYARDS (preserving trees), vertical pivoting wooden louvers, top hung windows with mesh inserts keeps out mosquitoes and allows breezes/breathing. 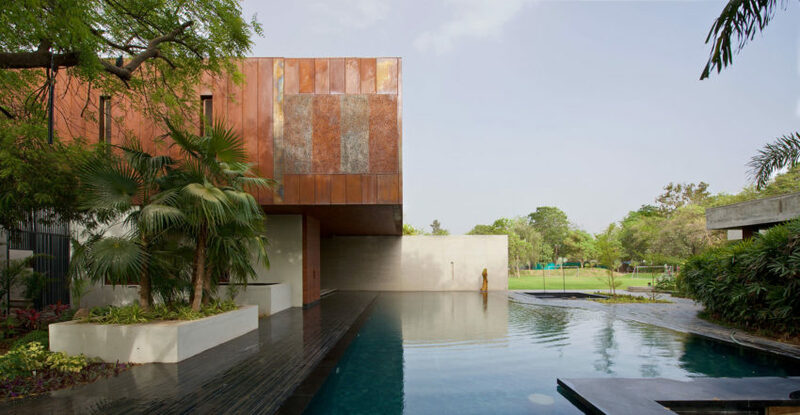 Aided by giant sliding glass walls, which retract into pockets, the living, dining spaces seamlessly connect with the surrounding verdant environment. 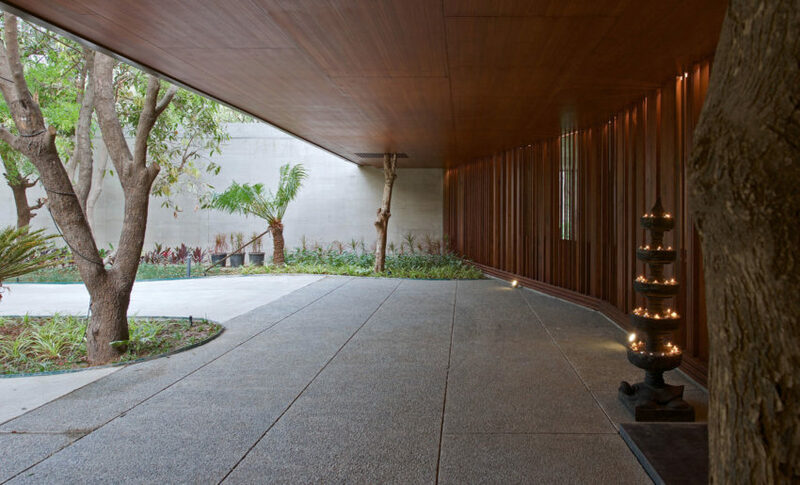 SHADE, from the upper cantilevering storey, brings respite and is welcoming in this tropical region. Apart from these measures, sprinklers activate on timers to humidify the courts which are all planted with Ferns, Monsteras, Allocasias, Philodendrons, Rafis palms, Terminalias and other plant species. 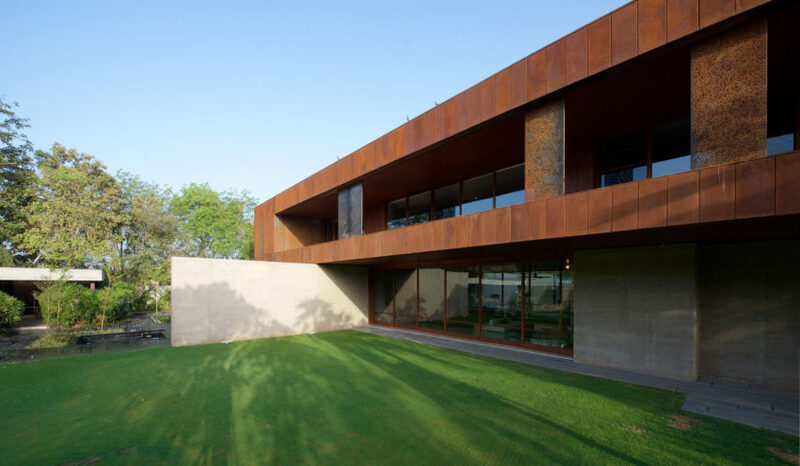 The upper storey is resolved with a SKIN of CORTEN, each single element of 0.5 meters x 5.5 meters (1.6 feet x 18 feet) high panels which hang off the internal structure, creating a ventilated façade, to again absorb the heat from the incident sun and release upwards vide air circulation behind them, hence reducing heat gain of the inner structure and spaces. The corners of the volume are perforated as Jaalis in the patterns of trees and branches, a bow to the SIDI SAIYYED MOSQUE JAALI, an architectural wonder of Ahmedabad. 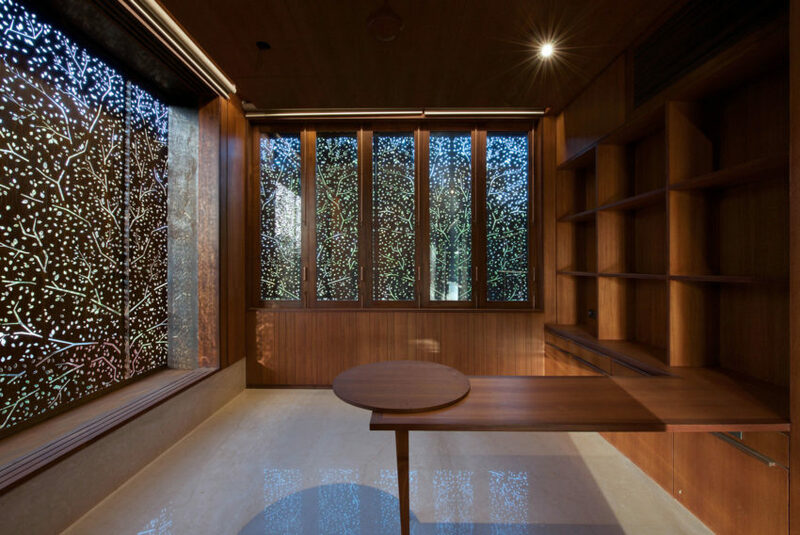 These spaces become dappled in patterned light and shade, along with the sliding screens on the principal eye of the façade, cooling the breezes through the VENTURI EFFECT of the Jaali screens. 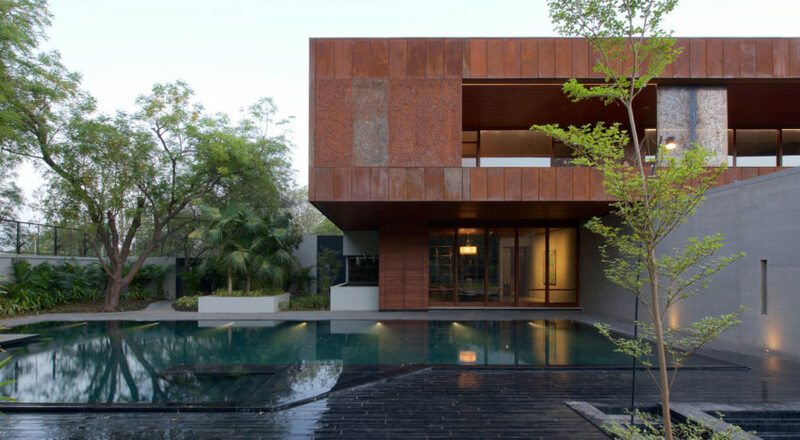 OVER DECK foam insulation coupled with reflective glazed tiles, sliding screens, giant Agassi (balcony) spaces and the VENTILATED CORTEN FAÇADE, all work in unison to reduce heat gain. The forthcoming nature of the clients, led to the design of an entire series of furniture and objects specifically for their home. These were all designed in 20mm x 20mm brass sections and salvaged wood. 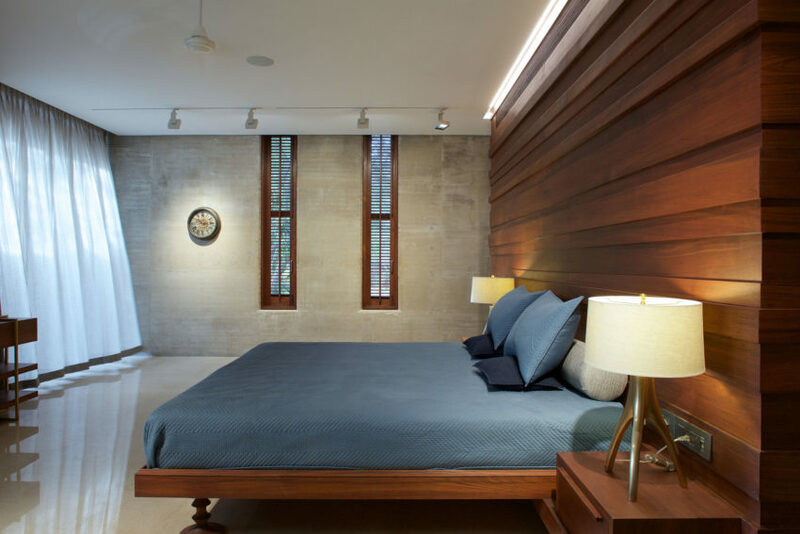 Mirrors, towel racks, book shelves, vanities, TV stands, occasional tables, nest of trays, were all designed as bespoke objects. 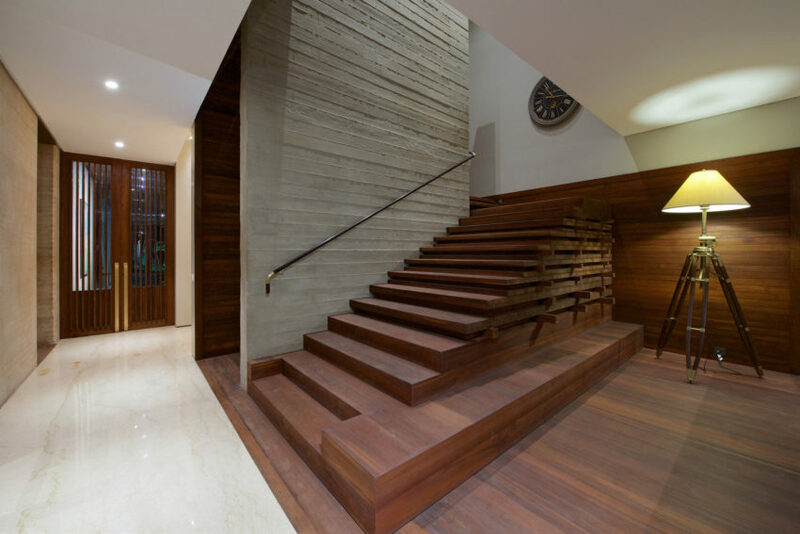 The Main staircase to the upper level, is an assemblage of thick wood akin to a stack in a drying yard, the stair rail, is crafted out of rosewood as a precious object with the bent corners of cast brass, pronouncing an elegant luxury along with a sense of TIMELESSNESS. 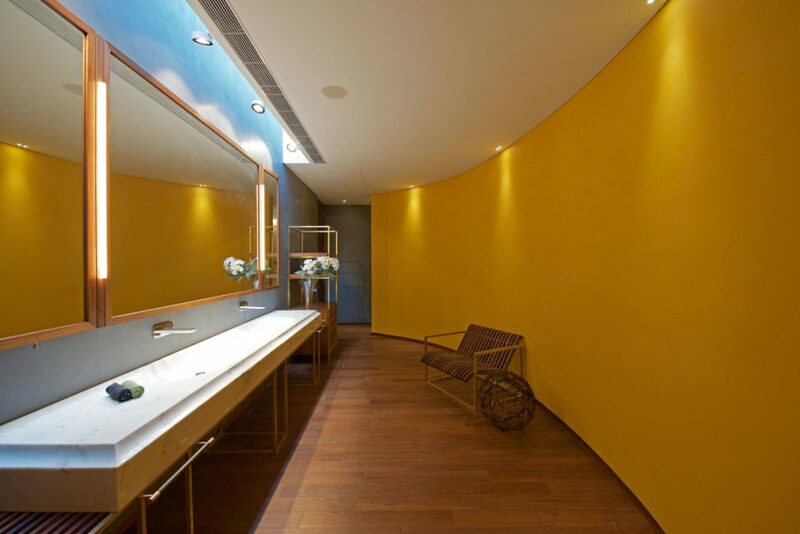 Throughout the project – the level of CRAFTMANSHIP is exquisite. All the ART is gifted to the clients by friends and family…. 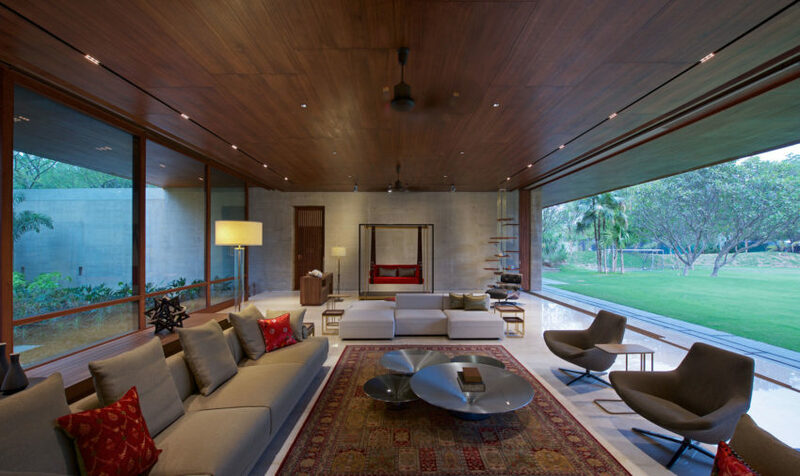 Projects like these, leave behind beautiful memories of their making, five years of pleasurable meetings, mock ups, successes and few failures, a sense of the entire team accomplishing a new level of awareness together, builders, carpenters, stone layers, metal smiths, polishers, gardeners, the CLIENTS and us the architects. This was a very, rewarding endeavor…….for all involved. Most of you is gratifying, amazing and motivating! Congratulations! Great work!